This article is about the type of nutrient in food. 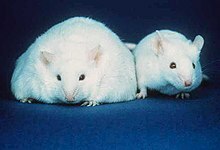 For fat in humans and animals, see Adipose tissue. For other uses, see Fat (disambiguation). Composition of fats from various foods, as percentage of their total fat. Fat is one of the three main macronutrients, along with carbohydrate and protein. Fats molecules consist of primarily carbon and hydrogen atoms, thus they are all hydrocarbon molecules. Examples include cholesterol, phospholipids and triglycerides. The terms “lipid“, “oil” and “fat” are often confused. “Lipid” is the general term, though a lipid is not necessarily a triglyceride. “Oil” normally refers to a lipid with short or unsaturated fatty acid chains that is liquid at room temperature, while “fat” (in the strict sense) specifically refers to lipids that are solids at room temperature – however, “fat” (in the broad sense) may be used in food science as a synonym for lipid. Fats, like other lipids, are generally hydrophobic, and are soluble in organic solvents and insoluble in water. Fat is an important foodstuff for many forms of life, and fats serve both structural and metabolic functions. They are a necessary part of the diet of most heterotrophs (including humans) and are the most energy dense, thus the most efficient form of energy storage. Some fatty acids that are set free by the digestion of fats are called essential because they cannot be synthesized in the body from simpler constituents. There are two essential fatty acids (EFAs) in human nutrition: alpha-linolenic acid (an omega-3 fatty acid) and linoleic acid (an omega-6 fatty acid). Other lipids needed by the body can be synthesized from these and other fats. Fats and other lipids are broken down in the body by enzymes called lipases produced in the pancreas. Fats and oils are categorized according to the number and bonding of the carbon atoms in the aliphatic chain. Fats that are saturated fats have no double bonds between the carbons in the chain. Unsaturated fats have one or more double bonded carbons in the chain. The nomenclature is based on the non-acid (non-carbonyl) end of the chain. This end is called the omega end or the n-end. Thus alpha-linolenic acid is called an omega-3 fatty acid because the 3rd carbon from that end is the first double bonded carbon in the chain counting from that end. Some oils and fats have multiple double bonds and are therefore called polyunsaturated fats. Unsaturated fats can be further divided into cis fats, which are the most common in nature, and trans fats, which are rare in nature. Unsaturated fats can be altered by reaction with hydrogen effected by a catalyst. This action, called hydrogenation, tends to break all the double bonds and makes a fully saturated fat. To make vegetable shortening, then, liquid cis-unsaturated fats such as vegetable oils are hydrogenated to produce saturated fats, which have more desirable physical properties e.g., they melt at a desirable temperature (30–40 °C), and store well, whereas polyunsaturated oils go rancid when they react with oxygen in the air. However, trans fats are generated during hydrogenation as contaminants created by an unwanted side reaction on the catalyst during partial hydrogenation. Saturated fats can stack themselves in a closely packed arrangement, so they can solidify easily and are typically solid at room temperature. For example, animal fats tallow and lard are high in saturated fatty acid content and are solids. Olive and linseed oils on the other hand are unsaturated and liquid. Fats serve both as energy sources for the body, and as stores for energy in excess of what the body needs immediately. Each gram of fat when burned or metabolized releases about 9 food calories (37 kJ = 8.8 kcal). Fats are broken down in the healthy body to release their constituents, glycerol and fatty acids. Glycerol itself can be converted to glucose by the liver and so become a source of energy. Example of a natural triglyceride with three different fatty acids. One fatty acid is saturated (blue highlighted), another contains one double bond within the carbon chain (green highlighted). 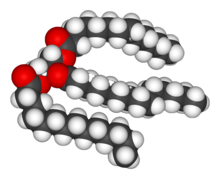 The third fatty acid (a polyunsaturated fatty acid, highlighted in red) contains three double bonds within the carbon chain. All carbon-carbon double bonds shown are cis isomers. There are many different kinds of fats, but each is a variation on the same chemical structure. All fats are derivatives of fatty acids and glycerol. Most fats are glycerides, particularly triglycerides (triesters of glycerol). One chain of fatty acid is bonded to each of the three -OH groups of the glycerol by the reaction of the carboxyl end of the fatty acid (-COOH) with the alcohol; I.e. three chains per molecule. Water is eliminated and the carbons are linked by an -O- bond through dehydration synthesis. This process is called esterification and fats are therefore esters. As a simple visual illustration, if the kinks and angles of these chains were straightened out, the molecule would have the shape of a capital letter E. The fatty acids would each be a horizontal line; the glycerol “backbone” would be the vertical line that joins the horizontal lines. Fats therefore have “ester” bonds. The properties of any specific fat molecule depend on the particular fatty acids that constitute it. Fatty acids form a family of compounds that are composed of increasing numbers of carbon atoms linked into a zig-zag chain (hydrogen atoms to the side). The more carbon atoms there are in any fatty acid, the longer its chain will be. Long chains are more susceptible to intermolecular forces of attraction (in this case, van der Waals forces), and so the longer ones melt at a higher temperature (melting point). Elaidic acid is the principal trans unsaturated fatty acid often found in partially hydrogenated vegetable oils. Oleic acid is a cis unsaturated fatty acid making up 55–80% of olive oil. Stearic acid is a saturated fatty acid found in animal fats and is the intended product in full hydrogenation. Stearic acid is neither cis nor trans because it has no carbon-carbon double bonds. Fatty acid chains may also differ by length, often categorized as short to very long. Short-chain fatty acids (SCFA) are fatty acids with aliphatic tails of fewer than six carbons (i.e. butyric acid). Medium-chain fatty acids (MCFA) are fatty acids with aliphatic tails of 6–12 carbons, which can form medium-chain triglycerides. Long-chain fatty acids (LCFA) are fatty acids with aliphatic tails of 13 to 21 carbons. Very long chain fatty acids (VLCFA) are fatty acids with aliphatic tails of 22 or more carbons. Any of these aliphatic fatty acid chains may be glycerated and the resultant fats may have tails of different lengths from very short triformin to very long, e.g., cerotic acid, or hexacosanoic acid, a 26-carbon long-chain saturated fatty acid. Long chain fats are exemplified by tallow (lard) whose chains are 17 carbons long. Most fats found in food, whether vegetable or animal, are made up of medium to long-chain fatty acids, usually of equal or nearly equal length. Many cell types can use either glucose or fatty acids for this energy. In particular, heart and skeletal muscle prefer fatty acids. Despite long-standing assertions to the contrary, fatty acids can also be used as a source of fuel for brain cells. Fats are also sources of essential fatty acids, an important dietary requirement. They provide energy as noted above. Vitamins A, D, E, and K are fat-soluble, meaning they can only be digested, absorbed, and transported in conjunction with fats. Fats play a vital role in maintaining healthy skin and hair, insulating body organs against shock, maintaining body temperature, and promoting healthy cell function. Fat also serves as a useful buffer against a host of diseases. When a particular substance, whether chemical or biotic, reaches unsafe levels in the bloodstream, the body can effectively dilute—or at least maintain equilibrium of—the offending substances by storing it in new fat tissue. This helps to protect vital organs, until such time as the offending substances can be metabolized or removed from the body by such means as excretion, urination, accidental or intentional bloodletting, sebum excretion, and hair growth. The location of the tissue determines its metabolic profile: visceral fat is located within the abdominal wall (i.e., beneath the wall of abdominal muscle) whereas “subcutaneous fat” is located beneath the skin (and includes fat that is located in the abdominal area beneath the skin but above the abdominal muscle wall). Visceral fat was recently discovered to be a significant producer of signaling chemicals (i.e., hormones), among which several are involved in inflammatory tissue responses. One of these is resistin which has been linked to obesity, insulin resistance, and Type 2 diabetes. This latter result is currently controversial, and there have been reputable studies supporting all sides on the issue. Numerous studies have also found that consumption of trans fats increases risk of cardiovascular disease. The Harvard School of Public Health advises that replacing trans fats and saturated fats with cis monounsaturated and polyunsaturated fats is beneficial for health. a 2014 meta-analyses of randomized controlled trials found that reducing fat and cholesterol intake does not effect cardiovascular disease or all cause mortality. ^ “Macronutrients: the Importance of Carbohydrate, Protein, and Fat”. McKinley Health Center. University of Illinois at Urbana–Champaign. Retrieved 20 September 2014. ^ “Introduction to Energy Storage”. Khan Academy. ^ a b Mozaffarian, Dariush; Katan, Martijn B.; Ascherio, Alberto; Stampfer, Meir J.; Willett, Walter C. (2006-04-13). “Trans Fatty Acids and Cardiovascular Disease”. New England Journal of Medicine. 354 (15): 1601–1613. doi:10.1056/NEJMra054035. ISSN 0028-4793. PMID 16611951. ^ “The human proteome in adipose – The Human Protein Atlas”. www.proteinatlas.org. Retrieved 2017-09-12. ^ Hooper, Lee; Martin, Nicole; Abdelhamid, Asmaa; Davey Smith, George (2015). “Reduction in saturated fat intake for cardiovascular disease”. Cochrane Database of Systematic Reviews (6): CD011737. doi:10.1002/14651858.CD011737. PMID 26068959. ^ “Fats and Cholesterol”, Harvard School of Public Health. Retrieved 02-11-16. ^ Harcombe, Zoë; Baker, Julien S.; Cooper, Stephen Mark; Davies, Bruce; Sculthorpe, Nicholas; Dinicolantonio, James J.; Grace, Fergal (2015). “Evidence from randomised controlled trials did not support the introduction of dietary fat guidelines in 1977 and 1983: a systematic review and meta-analysis”. Open Heart. 2: e000196. doi:10.1136/openhrt-2014-000196. PMC 4316589. PMID 25685363. Donatelle, Rebecca J. (2005). Health, the Basics (6th ed.). San Francisco: Pearson Education, Inc. ISBN 978-0-13-120687-8. OCLC 51801859.